In order to break mental fixation, we need to stop focusing on our learned rules. Every journalist suffers from "writer's block" sometimes. Whatever job you do, you can probably relate to how it feels to be stuck in a rut. According to new research, one reason for experiencing this is biological. Scientists from Queen Mary University of London and Goldsmiths University of London have discovered that using a targeted electric current to suppress a particular region of the brain can help break us out of these states of creative flux. The results were published in the journal Scientific Reports. The specific area of the brain is called the left dorsolateral prefrontal cortex, or DLPFC, and it is used for cerebral thinking and higher executive function. What this means is it's the area where you solve problems by applying the rules you've already learned. However, this can backfire if you come across an unfamiliar problem, because your brain may try and pigeon-hole the problem into a scenario it already knows. In the experiment, subjects show that participants who received the suppression of part of their brains showed a better ability to think outside the box. "We solve problems by applying rules we learn from experience, and the DLPFC plays a key role in automating this process," said Caroline Di Bernardi Luft, a professor from QMUL's School of Biological and Chemical Sciences and first author of the study. "It works fine most of the time, but fails spectacularly when we encounter new problems which require a new style of thinking — our past experience can indeed block our creativity." She added that in order to break this mental fixation, we need to loosen up our minds to stop focusing on our learned rules. 60 participants took part in the study, where their DLPFC was either temporarily suppressed or activated, or unstimulated in the control group. This was done by passing a weak electrical current through saline-soaked electrodes placed over the scalp. The direction of the current determined whether the brain region was activated or suppressed. The current was very low so there was no unpleasant sensation for the subjects. While this was going on, the participants were asked to solve tricky "matchstick problems" which required relaxing the rules of arithmatic and algebra. For example, they were given an incorrect arithmatic equation expressed in Roman numerals, and told to correct it by only moving one matchstick to another place. When confronted with these problems, subjects tend to activate their arithmetic knowledge, the paper notes. However, to actualy solve the problem you have to relax or override the learned constraints, such as how a plus sign cannot be turned into an equal sign. "The stronger the requirement of constraint relaxation, the harder the problem is to solve," the paper reads. 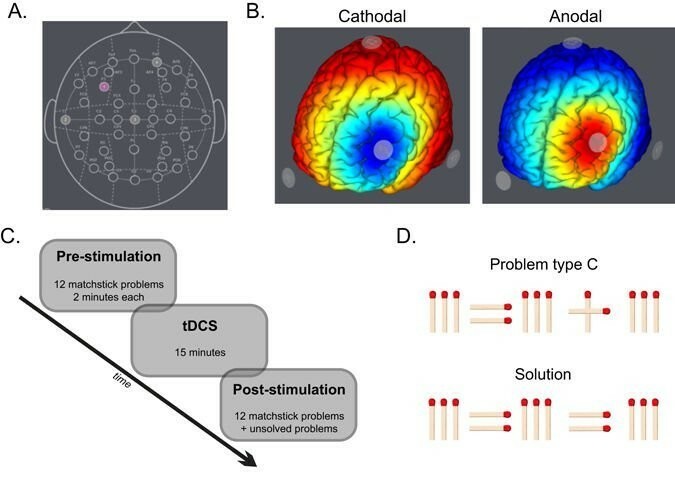 According to the results of the study, those who had their brain region temporarily suppressed were more likely to solve the harder problems than those whose brains were activated or untouched. From this, the researchers conclude that suppression might help you relax the constraints that come with remembering rules. However, Luft added that the potential applications for the technique will have to be thought through in more detail, rather than just assuming that suppressing your brain with an electric company can improve cognition. "I would say that we are not yet in a position to wear an electrical hat and start stimulating our brain hoping for a blanket cognitive gain," she said.